AN 124 – For a time the massive An-124 held the mantle of the world’s largest aircraft before the arrival of the An-225, a stretched six engine derivative. It is commonly used for oversize freight charters. Developed primarily as a strategic military freighter (in which role it can carry missile units and main battle tanks), the first prototype An-124 flew on December 26 1982. A second prototype, named Ruslan (after a Russian folk hero), made the type’s first western public appearance at the Paris Airshow in June 1985, preceding the type’s first commercial operations in January 1986. 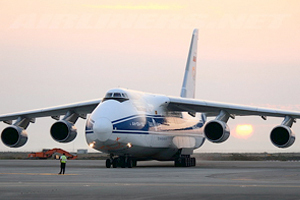 Since that time the An-124 has set a wide range of payload records, a recent achievement being the heaviest single load ever transported by air – a 124 tonne (273,400lb) powerplant generator and its associated weight spreading cradle, a total payload weight of 132.4 tonnes (291,940lb), set in late 1993. An-124 – Operating empty 175,000kg (385,800lb), max takeoff 405,000kg (892,875lb).